Steve Werner first got the ham radio bug as a teenager living in the New York City suburbs in the 1950s, thanks to the father of a Boy Scout friend who was a physicist and got both boys interested in radio and electronics. 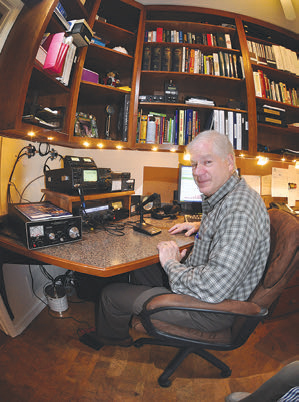 A Novice license soon followed, but then so did college, girls, etc., and ham radio took a back seat until after his kids were grown and Steve and his wife bought a house on a hilltop in Downingtown, Pennsylvania. Relicensed as KD3WK in the early ’90s, Steve put up a 75-foot Rohn 55 tower that supports a Force 12 C4 Yagi for 40-10 meters, a 3-element Cushcraft beam for 6, and a Cushcraft vertical for 2 meters and 70 centimeters. His station is built around an ICOM IC-746PRO and PW-1 amplifier (the control head for the amp is on top of the 746; the amp itself is on the floor). Also visible in our photo are a remote antenna selector and a Signalink computer interface for digital modes, as well as a Yaesu FT-847 for VHF/UHF. Steve says his main interest is working DX on 20-meter single-sideband, and while he does some CW and PSK31 operating, phone predominates because, as he puts it, “I like to talk.” He has talked his way to DXCC, Worked All Continents and Worked All States awards. He is also a volunteer examiner, Boy Scout Radio Merit Badge counselor and president of the Mid-Atlantic Radio Club.